Explore Italy’s ancient capital by night and see the historic architecture in a new light on this private 2-hour sightseeing tour of Rome. Frame famous landmarks such as the Colosseum, the Spanish Steps, and St. Peter’s Basilica on camera when the crowds have gone. Head along the Via Veneto and watch the city lights play on the Tiber River. Upgrade your private tour to enjoy a toast on Janiculum Hill — with panoramic views over the rooftops of Rome. Following an evening pickup at your Rome hotel, take a seat in your private vehicle at 7pm. Then, spin onward into the city to begin your 2-hour tour. As you explore Rome by night, stop for photographs at famous landmarks including the Colosseum, the Spanish Steps, St. Peter’s Basilica, and the Trevi Fountain, and capture your shots without the crowds. Marvel as the city lights dance over the Tiber River and explore the pretty Via Veneto. Along the way, soak up the magical atmosphere of Rome under nightfall. Upgrade your private tour to enjoy a toast on Janiculum Hill as the lights twinkle below. Then, return in comfort to your Rome hotel to bring your private evening tour to an end. this was a perfect way to see Rome at night. Driver was friendly and entertaining - he even sang for us! he misidentified a building or two, but, even with this, he was a wonderful, warm host and guide. 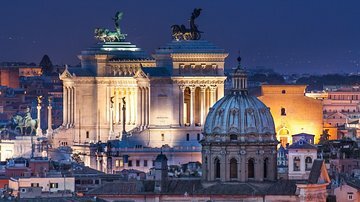 This is a great tour for your first night after flying in to Rome--you are exhausted with jet lag, so there isn't much walking and you get a good idea of the layout of the city and get to see how beautiful it is at night. Our driver picked us up promptly and drove us all around, even going past a place my son had requested which he hadn't planned on doing. We saw a lot during the tour, and often got out and walked around a little to take pictures and to see the sites. The driver was informative about what was where, but had very firm opinions on some things, which kind of rubbed me a little the wrong way, but hey, everyone is entitled to their opinion and it was fine, just a little awkward. And he was very nice, polite and talkative. He gave pretty good insight on a lot of the social/political forces that were happening currently in Rome and Italy. The car was nice, clean, and he also had handouts to read more about the places that he took us to. I would recommend this tour. Florido was an energetic and delightful guide. Very entertaining. In the two hours that were allotted, he was able to get us to the major and some unique sights. We took this tour the first night in Rome after an overnight flight from the US. It was just the right amount of time and gave a comfortable way to experience our first glimpse of Rome. Omg our driver was a previous entertainer. While in the private van he sang amazing Italian songs to us while we expertly and informatively toured the city! I highly recommend this tour. Rome at night was beautiful! tour was good, dispite over cast weather. Driver was friendly but was not very informative / forthcoming. Slightly disappointed when we were given plastic cups for the sparkling wine! My wife and I had a personalised tour of Rome by Constantino in his nice Audi A6 .... very flash. Constantino was very engaging and informative of the sights and scenes of Rome and with good recommendations on what to do in our spare time. This is an excellent way of seeing the city when the day is near the end and the lights are coming on and also in our case at the beginning of our visit of Rome - really one of the first things you should do. You see different colours and scenes and less crowds both in terms of the photo ops but on the roads. Constantino has his own way of sharing his knowledge with good humour and openness. A highly recommended experience, we hope you enjoy it as much as we did. This is a great trip for you first night in Rome! The driver picked us up at our hotel and proceeded to take us to all the high points. We saw some wonderful views and points of interest. Great first night in Rome! Driver arrived and apologised for dirty car due to rain that had sand in it, but made no effort to clean windows so view of places we were driven to was very poor. Advertised as 3 hour tour but was only 2, and seemed to be rushed. Only 2 stops to look around, one of which was at the end to see the view with a glass of prosecco. Extremely expensive for the poor experience. Wouldn't recommend this tour.